Mounted next to three black-and-white photographs of the artist standing before a mirror, the short statement says that Ms. Piper’s “critique of identity politics and desire to distance herself from being categorized as a ‘black artist’ ” led her to refuse reproduction rights for the work to appear in the exhibition catalog. However, the work has been included in the exhibition anyway to “highlight the urgency” of issues around art and racial identity. Artists are regularly included in exhibitions dedicated to aesthetic movements or curatorial conceits they don’t agree with. It’s just that “Embodied: Black Identities” deals with a category — race — that historically defined one’s status, not just as an artist, but as a human being in this country. Mr. Marshall’s 1997 lithograph “Memento” includes references to the civil rights movement, with little texts citing the Rev. Dr. Martin Luther King Jr., John F. Kennedy and others. Carrie Mae Weems’s photo triptych titled “Congo, Ibo, Mandingo, Togo,” from the 1993 series “Slave Coast,” documents a fort in West Africa from which slaves were shipped across the Atlantic. Mr. Hendricks, known for his portraits that celebrate style as a form of black identity (the benchmark for Kehinde Wiley, a younger painter who, like Mr. Hendricks, is a graduate of Yale’s master of fine arts program), turns here to the European diaspora. His canvas “APB’s (Afro-Parisian Brothers)” from 1978, derived from a photograph Mr. Hendricks took in Paris, features two young men — contemporary versions of Baudelaire’s 19th-century Parisian flâneur, or dandy — contrasted visually against a pop-inspired flat pink-lavender background. Earlier works in the show cite the struggles of African-Americans in the Jim Crow era. Elizabeth Catlett’s linocut print, from her 1947 series, “The Black Woman,” reveals its approach in the title: “My Role Has Been Important in the Struggle to Organize the Unorganized.” The print borrows from the graphic style of Mexican revolutionary art — Ms. Catlett herself has lived in Mexico for many decades — and refers as much to labor organization as racial struggles. John Woodrow Wilson also adopted the lineage of Mexican revolutionary art: He studied fresco techniques with Diego Rivera and David Siqueiros at the Esmeralda School in Mexico in the 1950s. “The Incident,” a watercolor and ink on paper from 1952, takes as its subject the lynching of a black man by hooded Ku Klux Klan figures. Distinctly African practices, like woodcarving, are adopted in Alison Saar’s “Bat Boyz” from 2001. 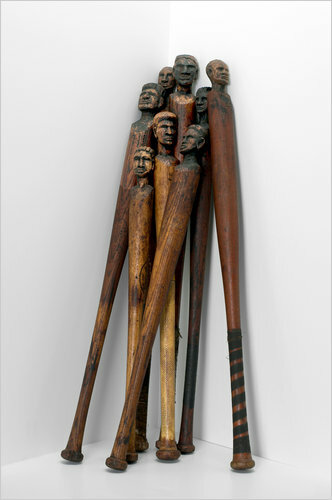 Eight baseball bats with men’s faces carved into their ends and blackened with pitch (black resin) are leaned against the wall, commenting on the discrimination experienced by black players in the early days of the sport. Nearby, a cane carved around 1867 by Henry Gudgell, a former slave from Kentucky, includes geometric designs and lizard and tortoise figures, common elements of the Afro-Georgian carving tradition. Other works resist any distinctly African-American identification. Howardena Pindell, another Yale M.F.A. graduate who has been working abstractly, for the most part, since the late 1960s, is represented by an etching and lithograph from 1980 based on a grid, one of the 20th century’s prime motifs of abstract art. Felrath Hines’s oil on linen “Piano-Forte,” from 1988, similarly resists any easy racial identification. Instead, its geometric forms were inspired by Josef Albers — who taught a famous color-theory course at Yale for many years — and Albers’s “Homage to the Square” series. More to the point, Mr. Hines, like Ms. Piper, did not want to be identified as a black artist. For that reason, he refused to take part in the 1971 exhibition “Contemporary Black Artists in America” at the Whitney Museum in New York. He died in 1993, so we don’t have his voice to bolster Ms. Piper’s sentiments — sentiments that are, in many ways, the perfect conceptual statement for this show, since they confront the scholarly and curatorial urge to categorize. Ms. Piper’s training in philosophy and her work — she is a successful artist with a long exhibition history and strong critical support — regularly question the Western tradition of thought that underpins thinking about race, aesthetics and categorization. (She has described her own life as the “gray experience,” rather than the “black experience,” partly because her complexion defies easy white or black identification.) And no matter how modest a show this might be, given the subject, nearly every work, from the smallest print to Ms. Piper’s more vocal gesture, contributes to that longer, larger and louder conversation about race in this country, which predates and eclipses any one artist’s effort. 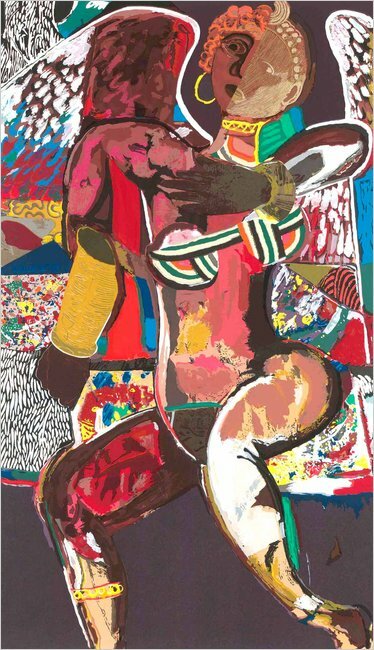 “Embodied: Black Identities in American Art From the Yale University Art Gallery,” through June 26 at Yale University Art Gallery, 1111 Chapel Street, New Haven. For information: (203) 432-0600 or artgallery.yale.edu.